When I became a first time mom I worried about a lot of the different health concerns that could arise. How would I treat the ailments and how would I know what to do. It all seemed a bit scary to me. In my first week of being a new mom my son developed Thrush. The midwives caught it and gave me a few natural remedies to treat it. A few of the items they mentioned we did not have on hand. Which meant that we needed to take a trip to our local health food store. While searching around for a few homeopathic tablets we spoke with a nutritionist/herbalist. She asked us a few questions and suggested a few other solutions for Thrush. Then she took us to the book aisle and told us she highly recommended the book Smart Medicine for a Healthier Child. She further explained that she often uses it as a reference and said that every mother should own one. 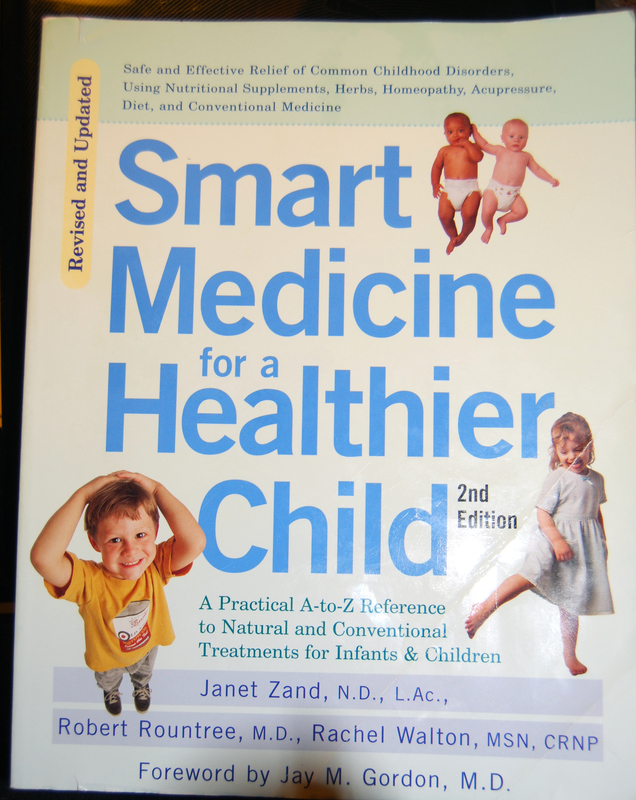 Smart Medicine for a Healthier Child is written by three authors: Janet Zand, N.D., L.Ac., Robert Rountree, M.D., and Rachel Walton, MSN, CRNP. With so many important decisions we make in caring for the health of our child, we parents need something to reference. Smart Medicine for a Healthier Child offers an extensive range of health concerns that could very well come up during infancy and childhood. What’s great about the book is that it explains the best of both worlds- natural and conventional treatments. Which enables parents to combine both approaches. Natural treatments include nutritional supplements, herbs, homeopathy, acupressure, and diet. It’s loaded with valuable information and treatment options. You’ll learn how to administer homeopathic medicine, the pros and cons of conventional medicine and what steps are necessary to help keep your little ones from suffering. Smart Medicine for a Healthier Child also provides you with specific advice on a variety of medical conditions. Emergency treatment recommendations are highlighted for quick and easy reference. It even discusses immunization related problems and reports why and how they’re given. I’m so glad we picked up a copy of this awesome book which I often refer to as our “medical dictionary”. We have referenced it on many occasions and it has helped us to make informed decisions- as opposed to making decisions I was not comfortable with or last minute decisions. It is undoubtedly the best investment we’ve made thus far in our parenting journey. Just like the woman who highly recommended it to us… I highly recommend it to you. It’s a must-have. I can’t believe I have never heard of this book. My daughter had thrush as a baby too. My midwives suggested powdered acidophilus on her tongue, but I remember having to be careful so she wouldn’t inhale the powder. It did work. I highly recommend Aviva Jill Romms books as well- President of the American Herbalists guild. My mother-in-law gave me this book after the birth of my first child. It is definitely my go-to book when my kids get sick! It’s straightforward and offers different solutions to illnesses. If you’re not well versed in homeopathic medicine, this is a great starting point!